Obamacare’s exchanges have officially been open for business for nearly a week, but some uninsured people are still either confused, unaware or dismissive of some of the key provisions of the law. 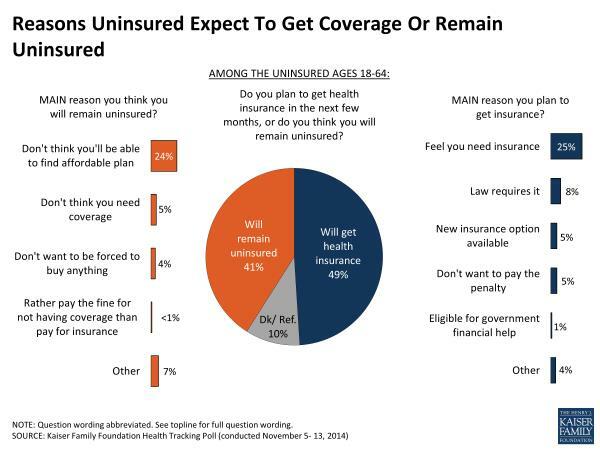 A new Kaiser Family Foundation survey of 154 uninsured people with a margin of error of 9 percent, suggests that uninsured Americans are still uninformed about Obamacare, despite almost nonstop media coverage as well as the Obama administration’s outreach efforts. Although nine out of 10 uninsured people had no idea when they could sign up for coverage through the health exchanges, 41 percent of those surveyed said they preferred to remain uninsured and therefore didn’t care about signing up. This is bad news for the Obama administration, since one of the primary goals of the law is expanding coverage to uninsured people. Though this survey did not spell out how many people knew about financial assistance available in the form of tax credits to make coverage more affordable, previous polls indicate that the number is quite large. According to an earlier KFF survey, nearly 40 percent of Obamacare enrollees had no idea they were receiving subsidies to make their health care more affordable. Indeed, without these subsidies, the premiums sold on these plans would increase by an average of 43 percent, The New Republic noted. In Florida, for example, the average monthly premium would be about $350, or $70 with subsidies. Ignorance of the law and its provisions could be an issue for uninsured people down the road—as the penalty for not having insurance will nearly triple in 2015. Just last week, Gallup released a survey revealing that about 35 percent of uninsured people say they are more likely to pay the Obamacare penalty than purchase health coverage this year. The survey, however, did not disclose that the penalty, which was $95 this year, will shoot up to $325 in 2015. It is unclear if the poll’s results would have changed, had people been made aware of this. Obamacare’s 90-day open enrollment period began on November 15, and lasts through February 15, 2015. During this time, consumers can shop around and select policies on the state or federal health exchanges. For coverage beginning immediately on January 1, consumers must enroll by December 15. Consumers can log onto the state or federal exchange websites to find out if they qualify for subsidies. The Kaiser Family Foundation also has a subsidy calculator that allows people to enter their income information in order to calculate potential subsidies. Under the law, United States citizens earning up to 400 percent of the federal poverty level, or about $46,000 for an individual or $94,000 for a family of four, will qualify for financial assistance to put toward a plan sold on the exchanges. The amount you receive depends on your income and whatever plan you select. Under the law’s individual mandate, the penalty for not having health coverage in 2014 is $95 or 1 percent of one’s annual income. But that nearly triples in 2015 to $325 or 2 percent of income—and then in 2016, it jumps to $695 or 3 percent of annual income. However, there are exemptions to the penalty depending on one’s annual income, or if that individual has only been without coverage for three months or less. People can also apply for the hardship exemption which is granted on a case by case basis. The Congressional Budget Office has estimated that about 80 percent of uninsured people will be exempt from the mandate. For more information on the law, check out The Fiscal Times’ 2015 Obamacare guide for consumers here.